Deputy Minister of National Defence Sen. Lieut. Gen. Nguyen Chi Vinh on February 13 handed over the President’s decision to another officer to take on duty at the United Nations peacekeeping mission in South Sudan. Speaking at the ceremony, Director of the Vietnam Department of Peacekeeping Operations Colonel Hoang Kim Phung said the agency has been active in preparing to dispatch its staff to UN peacekeeping missions. Lieut. Col. Tinh expressed his honour to be directly involved in UN peacekeeping activities. 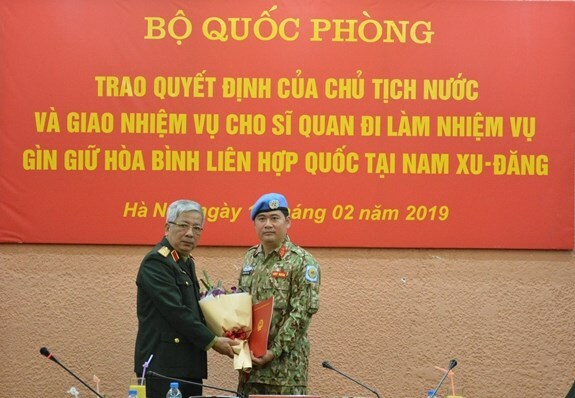 Tinh pledged to do well in his duty for the term, contributing to implementing Vietnam’s plan on joining in UN peacekeeping operations during the 2015-2020 period. In his speech, Deputy Minister of National Defence Sen. Lieut. Gen. Nguyen Chi Vinh praised Major Do Thi Hang Nga for her contributions during her term in South Sudan, asking her to continue adding to consultancy efforts in the field of UN peacekeeping, especially in the preparation of female officers for the work in the time ahead. He also asked Lt. Col. Tinh to learn from the experience of his comrades in order to perform well in his upcoming duty. Vinh said Vietnam is making necessary preparations for the second level-2 field hospital and the engineer corp, readying them for UN peacekeeping missions. In June 2018, the UN recognised the Vietnam Department of Peacekeeping Operations as one of four international training centres in the region and agreed to carry out training under the three-party partnership (comprised of Vietnam, the UN, and a partner country).